Knee pain can occur from an injury or a condition like osteoarthritis, and can impact activities of everyday life. There are many remedies for this condition, including rest, anti-inflammatory medications and using knee braces. Knee pain can occur from an injury or a condition like osteoarthritis, and can impact activities of everyday life. There are many remedies for this condition, including rest, anti-inflammatory medications and using knee braces. For individuals whose knee pain progresses or does not respond to other types of treatment, injections may be an option to help relieve pain and discomfort. Cortisone, or corticosteroid shots, are administered into the knee joint to reduce inflammation, says Knee Pain Info, an information website posted by doctors an physical therapists. These injections are typically given to individuals with severe knee pain that is accompanied by significant swelling of the knee. Relief from the injection can last for days to months, with reduced effectiveness with each successive shot. 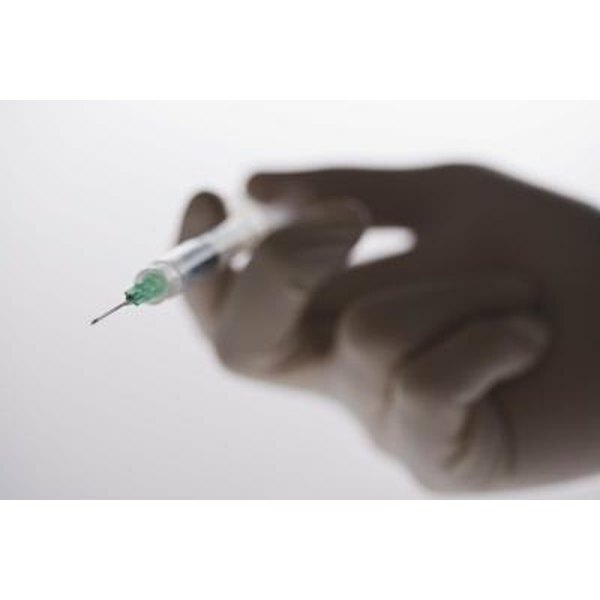 The risks of cortisone shots that Knee Pain Info lists include increased articular cartilage breakdown and a small possibility of infection or allergic reaction to the shot. Some individuals experience a flare-up of swelling in the first few days after an injection; this can be controlled by anti-inflammatory medication. Synvisc, the brand name for the drug Hylan G-F 20, is a derivative of hyaluronan, a viscous fluid, says RxList.com. The fluid is similar to synovial fluid, which is naturally found in the knee joint and acts as a shock absorber. This injection is usually given to individuals with osteoarthritis who are experiencing pain and have not experienced relief with other treatments. These injections are given once a week for three consecutive weeks. Side effects listed by RxList.com include pain or swelling in the injected knee, joint warmth, gait problems, joint stiffness, injection site pain and arthritis. Individuals who are allergic to birds, bird products, egg products and feathers should talk to their prescribing physician before they get an injection, RxList.com notes. Prolotherapy injections may be used in patients who have both chronic and acute knee pain, says CaringMedical.com. These injections contain an agent that triggers the inflammation process in the body, which is part of how the body heals itself. The injection places this substance in a contained area, causing localized inflammation, which then triggers the healing process. New collagen is formed and it tightens the ligament that was injected with the substance. According to the website, this procedure is best for knee pain or injuries caused by weakness in the ligaments or tendons. Hyalgan is another type of hyaluronate injection that may be used to treat knee pain; this is similar to Synvisc and is usually given to individuals with osteoarthritis. Euflexxa is an injection also used in treating osteoarthritis and is a derivative of hyaluronate. Side effects of these medications are similar to those of Synvisc.